Publisher: Walter Scott. Exact date unknown, but previous owner’s inscription reveals it to be no later than 1899. 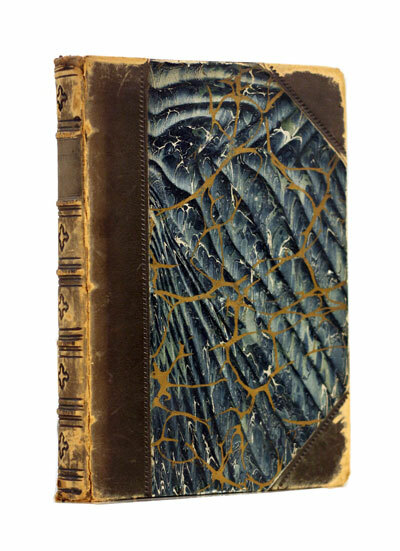 Condition: Hardcover, leather spine and corners with marbled hard boards. Significant wear to leather spine and corners, all gilt on spine rubbed off, edges rubbed, interior is good. The Nicomachean Ethics is the name normally given to Aristotle’s best-known work on ethics. The work, which plays a pre-eminent role in defining Aristotelian ethics, consists of ten books, originally separate scrolls, and is understood to be based on notes from his lectures at the Lyceum, which were either edited by or dedicated to Aristotle’s son, Nicomachus. 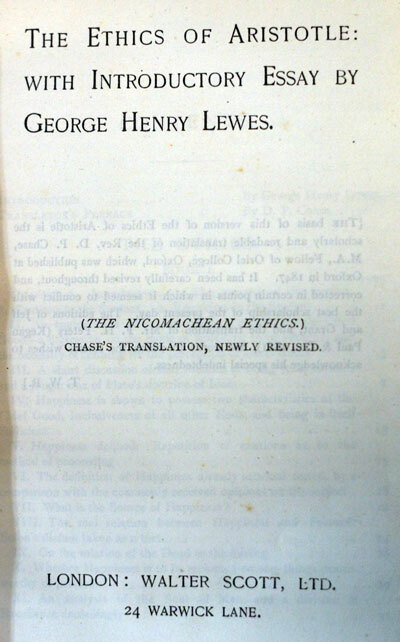 The Nicomachean Ethics is widely considered one of the most important historical philosophical works, and had an important impact upon the European Middle Ages, becoming one of the core works of medieval philosophy. It therefore indirectly became critical in the development of all modern philosophy as well as European law and theology. Many parts of the Nicomachean Ethics are well known in their own right, within different fields. In the Middle Ages, a synthesis between Aristotelian ethics and Christian theology became widespread, especially in Europe. While various philosophers had influenced Christendom since its earliest times, in Western Europe Aristotle became “the Philosopher” inspired by the Spanish Muslim philosopher Averroes. The most important version of this synthesis was that of Thomas of Aquinas. Other more “Averroist” Aristotelians such as Marsilius of Padua were controversial but also very important. A critical period in the history of this work’s influence is at the end of the Middle Ages, and beginning of modernity, when several authors such as Niccolò Machiavelli, Francis Bacon and Thomas Hobbes, argued forcefully and largely successfully that the medieval Aristotelian tradition in practical thinking had become a great impediment to practical political thinking in their time. However in more recent generations, Aristotle’s original works (if not that of his medieval followers) have once again become an important source. More recent authors influenced by this work include Alasdair MacIntyre, Hans-Georg Gadamer and Martha Nussbaum.